to Launch Disaster Relief Effort to Rebuild Homes & restore Lives! The devastation from Hurricane Maria left the people of Puerto Rico struggling to survive each day! Their homes are damaged, with many struggling to live in the "roofless" shell of their homes. It is now 6 months since the monster storm hit Puerto Rico, and over 20 percent of their citizens are still trying to survive without shelter, power, and clean water! This is an urgent Humanitarian crisis! Rebuild Homes & Restore Lives! This is Joy Millsaps, CEO and Founder of our nationwide public charity, HYDRO RELIEF and Water Conservation Resources. HYDRO RELIEF will initiate MISSION PHOENIX to spearhead the mass recovery and rebuilding of homes in Puerto Rico. Our contractor teams will service the communities hardest hit by the catastrophic Storm: Yabucoa, Humacao, Utuado. All contractor services will be donated for free to the communities in need! Carlos Purcell, CEO of IG BUILDERS, Corp and INTEGRA DESIGN Group of Puerto Rico is the Director of the reconstruction project. All Contractor groups will subcontract, under the IG BUILDERS, Corp Class A license. A Building Supply Center for MISSION PHOENIX is secured with HOME DEPOT. All building materials, lumber, tools, equipment, and appliances, will be purchased from the Merrifield, Virginia HOME DEPOT. 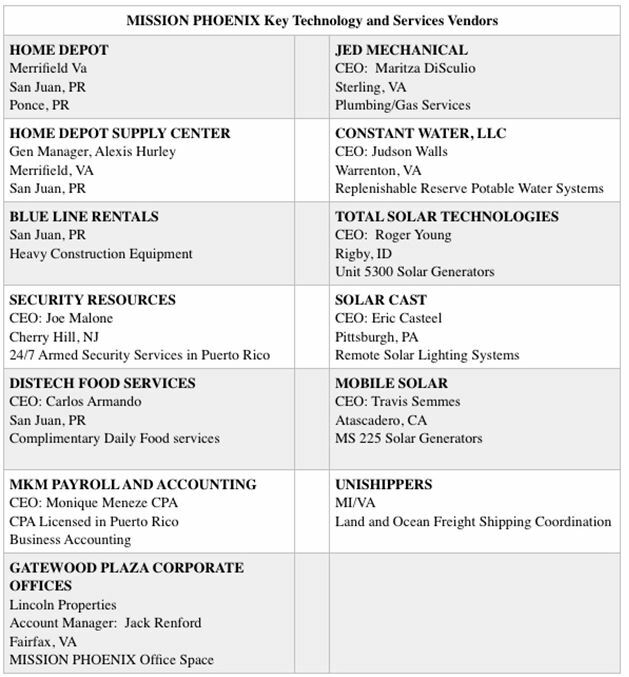 The Merrifield HOME DEPOT Team will coordinate delivery of purchases with the Ponce and San Juan Puerto Rico HOME DEPOT stores. 65% of the population of Puerto Rico are renters while only 35% are owners of their homes and properties. All of this will be done at no cost to those families. Thousands of homes restored, and hundreds of Puerto Rico's citizens employed! Whether repaired or rebuilt, these families will return to their homes better prepared for future storms. All of this will be accomplished without the use of government funding! This is Americans helping each other at its best. HYDRO RELIEF and Water Conservation Resources, a registered U.S. 501c(3), will be the MISSION PHOENIX governing entity. Our solid leadership and management members will oversee and execute the activities ensuring quality construction, detailed accounting and reporting, and effective and efficient use of donated funds, equipment, and materials. MISSION PHOENIX will spearhead the repair and reconstruction of homes in Puerto Rico, with our recovery teams beginning our work in communities that were the hardest hit by the storm: Yabucoa, Humacao, and Utuado. Our goal is to restore 3,000 homes using hundreds of Puerto Rico’s skilled professionals and tradespersons. In each of these communities, our teams will stage centrally to a cluster of 20 homes for an “Assembly Build” process. As each home cluster build is completed, construction teams will immediately move to begin construction activity on the next cluster of 20 homes. This method will permit the most efficient application of manpower and equipment toward the mass reconstruction of all the homes in the cluster. Yabucoa will be the staging site of the first rebuilding project. MISSION PHOENIX leaders face the profound challenge to research and verify the legitimate owner of house and property. A significant percentage of the homes will lack title to house or property; were built without permits and compliance to building codes and without licensed builders or contractors. For all of the candidate homes, our team will verify ownership and repair/rebuild in full compliance with Puerto Rico building codes. Once the owners of the home have been qualified, and written owner permission is documented to allow the reconstruction of their home, the Assessment Team will initiate action. Our Team Leaders will coordinate efforts with Puerto Rico's government leaders to arrange shelter for the families that will need to vacate their homes during the rebuilding process. The Assessment Teams, comprised of Integra Design Group architects/engineers and building trades experts, will assess, photograph & document the level of damages. In addition, the Assessment Team will draft a Recovery Repair and Rebuild Plan for each home. The plan will coordinate with a standardized design plan/ blueprint to map & guide the rebuilding process. The Assessment Team Leaders will obtain all permits required for the reconstruction on each home, document assessments, and develop blueprints. For candidate homes in each of the three targeted communities, MISSION PHOENIX will assess the most important commodity of all: Water. Many have been without potable water for months. This presents a significant health risk. As part of our effort, MISSION PHOENIX will be installing Constant Water systems in these homes. 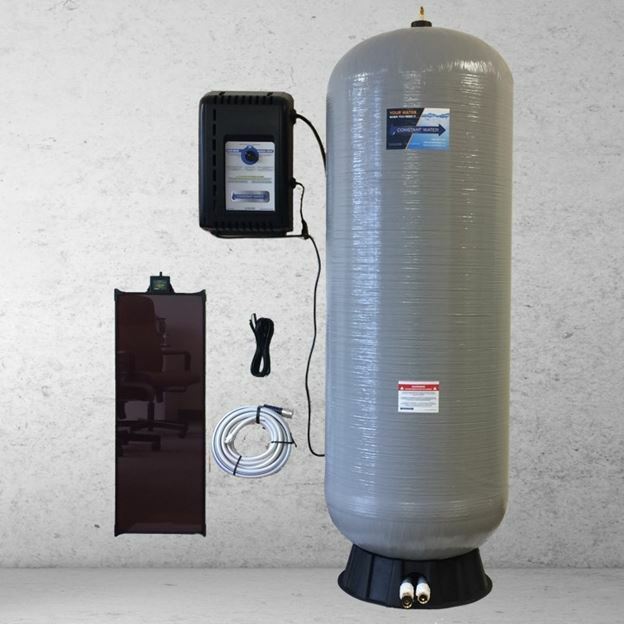 Constant Water’s Replenishable Reserve Water Systems will provide immediate relief to those homes by serving as a temporary pressurized water supply to the home. Constant Water systems are battery-powered, solar-supplemented units that will be filled with potable water from bulk water delivery vehicles. These systems can be quickly connected to a range of existing fittings in the home and will provide clean, potable water to all faucets and toilets in the home. During construction of the home, the Constant Water systems will be permanently installed, serving as a replenishable potable water reserve during future storm scenarios. Our teams will be working long hours in areas still without power. To alleviate the power out conditions, we have teamed with key technology providers to assure both power and lighting are available during the construction. For power during the construction activities, MISSION PHOENIX will deploy mobile solar generator systems provided by Mobile Solar of Atascadero, CA and Total Solar Technologies of Rigby, ID. 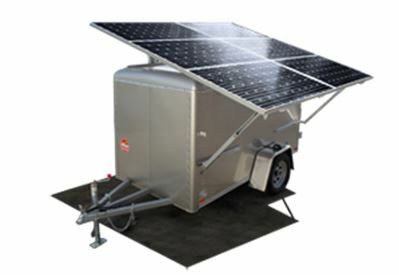 Mobile Solar will be providing their MS-225 Solar Generator Trailer. The MS-225 is their most compact unit with the big inverter system. These systems are designed for off-grid homes, commercial construction sites and agricultural water-pumping applications. 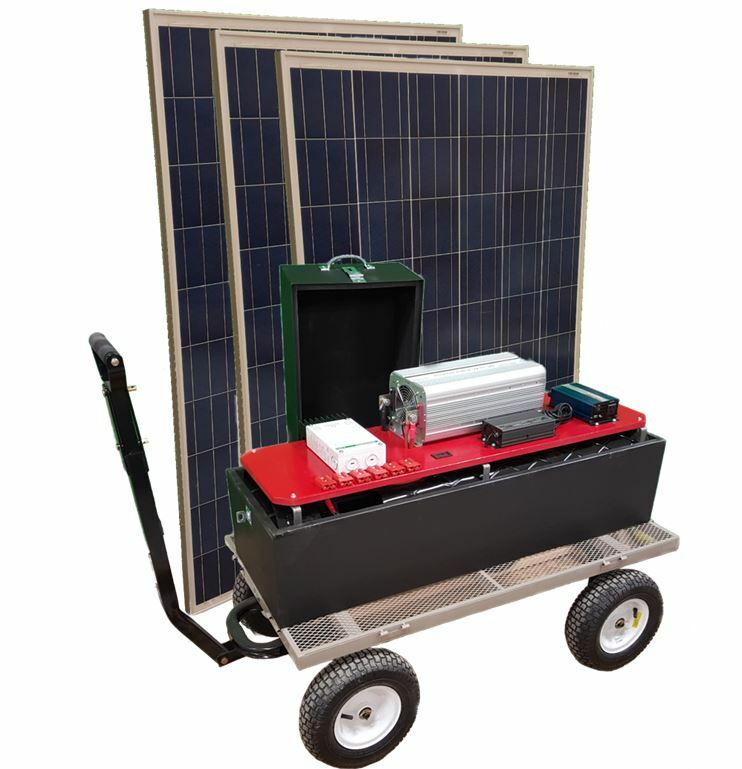 The MS-225 model solar trailer is light enough to be towed behind small 8-cylinder trucks and powerful enough to run rated loads of 7,200 watts. The MS-225 also offers considerable cargo space – and comes standard with a side entry door. Total Solar Technologies of Rigby, ID will be supplying the Solar Max 5300 portable solar generator to the MISSION PHOENIX efforts. The Solar Max 5300 is a tough portable solar generator capable of powering most household appliances and home tools. The 5000 watt modified sine wave inverter comes with four AC outlets capable of outputting up to 1500 watts each and an AC Direct Connect terminal block that can be hard wired to a device to pull the maximum 5000 watts from the inverter. These state-of-the-art solar systems will provide all of the electrical power necessary for construction and will allow smooth movement between home cluster efforts. 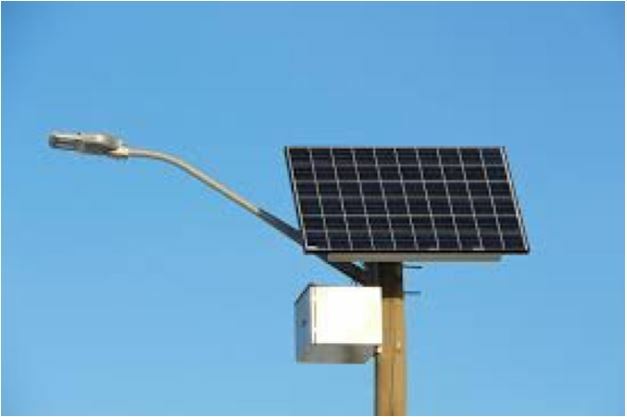 Additionally, Solar Cast of Pittsburgh, PA will provide mobile LED lighting for use in low-light construction conditions and for night time monitoring of construction materials/equipment. Solar Cast's Cube Lighting Systems, will be critical in assuring MISSION PHOENIX lighting needs are met as local power restoration continues. 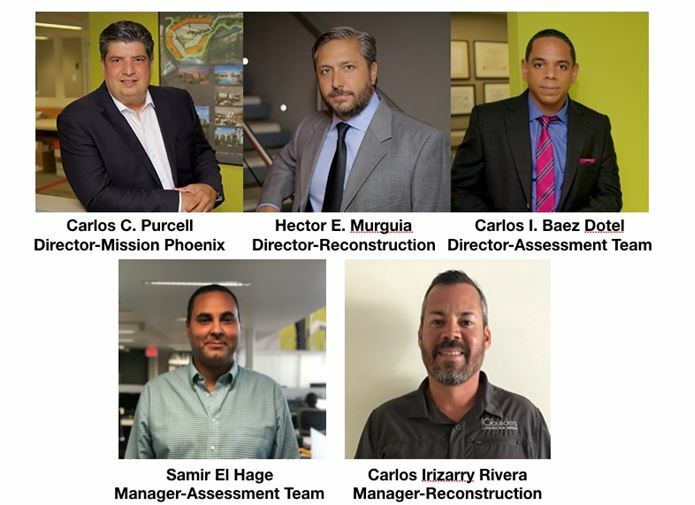 Carlos Purcell, CEO of IG Builders, Corp and Integra Design Group of Puerto Rico, is the General Contractor and the Director of the reconstruction project. All contractor groups will subcontract under IG Builders’ Class A Contractor's License. This construction management structure ensures quality construction, efficient use of manpower, solid accountability of materials, and strong compliance with local building codes. The average home in Puerto Rico is an 800 square foot, 2-bedroom, 1-bath, 1-story structure. These are typically constructed with cinder blocks, beams, and “flat” zinc metal covered roofs. We have standardized the designs to link with the level of damage to the home. The Assessment Teams will determine the rebuilding strategy and required building plan for each home. 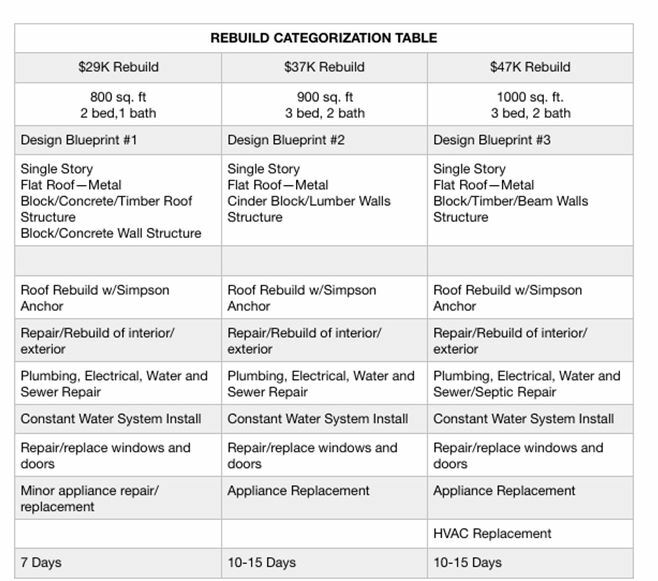 The Assessment Teams will categorize each home into one of three rebuild categories as shown above. The size and construction materials of the home, combined with the level of damage will determine its rebuild category. 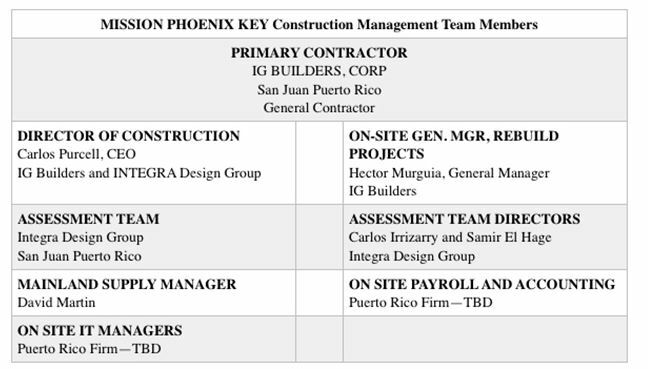 Master builder IG Builders, LLC of San Juan, Puerto Rico, will lead the construction and contractor teams. Mr. Carlos Purcell, CEO of IG BUILDERS, will oversee and direct all of the construction activities. All MISSION PHOENIX services will be donated for free to the communities in need. HOME DEPOT has coordinated a Supply Center and Supply Line for MISSION PHOENIX. HOME DEPOT will supply all tools, equipment, & appliances. We have worked hard to build an exceptionally strong team of Technology and Service providers. Each were chosen based on their record of solid service, outstanding capabilities, and proven technologies. Each will perform a critical role in ensuring the timeliness of the rebuild, the quality of the construction, the reliability of their technologies, and the accountability for the use of donated funds. Our commitment to the families that were hit so severely by the hurricane, and to those who donate to this effort, will not be compromised. 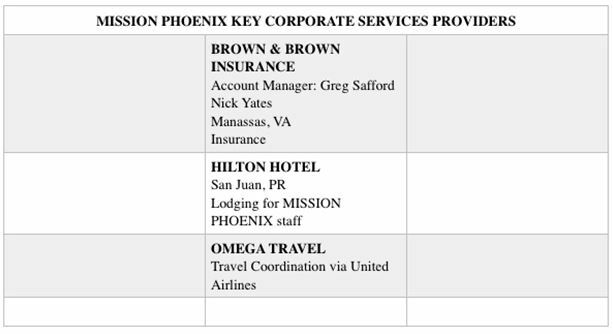 We would like to extend a most deserved "Thank You" to important organizations that have worked so diligently to provide key support to MISSION PHOENIX. Without them, our efforts would be greatly challenged. Thank you for your support of our urgent Mission to Rebuild Homes and Restore Lives in Puerto Rico!